Ross started racing Go-Karts in the early 1960’s in Clearwater, FL. Over the next few years he raced in the S.C.C.A. in V.W. sedans, BMW 700 sedans, Formula Junior, Beach Formula V and finally in 1965 his Anglia Super 1300 in S.C.C.A. C/sedan. 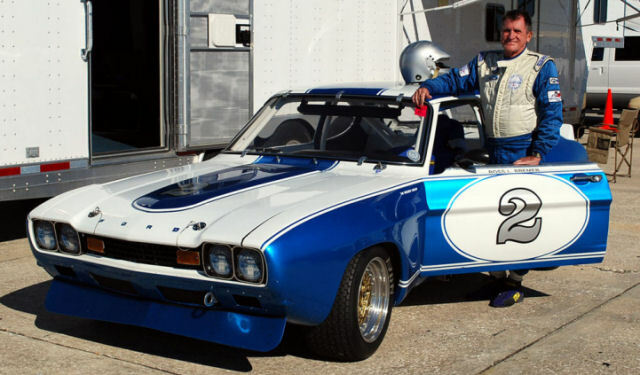 He won numerous races in SCCA regional races and in 1966 was invited to Riverside for the Run Offs as an alternate. In 1967 he entered and drove a Lotus Cortina in under 2 liter touring in the Daytona 24-Hr finishing 3rd in class and 21st overall with Don Kearney. The same year entered the Anglia in the Sebring Trans/AM 4-Hr, but D.N.F. in the last minutes. He retired from auto racing to race sailboats and motorcycles for 15 years. Ross and Karen continue racing now with 6 racing European Fords in their stable and multiple championships in Groups 1 & 8.